Are you planning a bachelor or bachelorette party or group trip to Ellesmere Port? Please, contactEllesmere Port Minibus to provide transport services for you and 23 other of your friends and/or family. With our very quality-maintained and professionally serviced 24-seater minibusses, we will are here to make sure that al attended are comfortably transported to the desired destination around Ellesmere Port By allowing Ellesmere Port Minibus to transfer you, you get to experience a timely and safe trip. Please get in touch with Ellesmere Port Minibus, whenever you need transport services for large groups of 20 or more people. We are the best company to contact when you are in need of transfer services, for your large group of guests. From local sports events to restaurants, the markets, the churches, attraction sites in the city, conferences, meetings and many other more destinations. 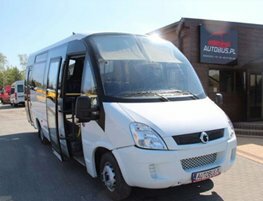 The 24 seater bus has plenty of storage room, where every passenger will comfortably put their luggage, without risk or damage. Be guaranteed that our 24 seaters are well-designed with enough leg room so that you can stretch and move your legs comfortably, throughout the journey. Contact Ellesmere Port Minibus to take you to your church group retreat, birthday party, baby shower or graduation party. Our hire company is more than willing to provide you with transfer services all over Ellesmere Port. With this car, you can take small groups in church or school on excursions to major parts of the country. It is equipped with air conditioning and seats that are developed ergomically so that even if you sit in this car for a long time, you won’t even feel it.